Basement Technologies of the Alleghenies has the right solution for your wet basement or wet crawl space problem. We are proud to be a part of one of the fastest growing and most progressive basement waterproofing companies in the world. Our company designs and manufactures many of our own innovative (and patented) waterproofing and dehumidification products. No matter what the problem is, from basement leaks and wall cracks to crawlspace moisture, we have industry leading tools and expertise to solve your waterproofing problems once and for all. Protect your most valuable asset... your home. Your home is your most valuable asset, and each home's basement is different. Your foundation may be fieldstone, cement, or concrete blocks. All experts agree that the most common water entry points the floor wall joint, wall cracks, floor cracks, and down the walls creating wet basement problems. Because of the eventual build up of water pressure against the foundation, even the smallest leak can lead to a flooded basement, potentially costing thousands of dollars in repairs and mold and mildew remediation. Protect your home and the health of your family today by making your basement a safe, dry, stable environment with help from Basement Technologies of the Alleghenies. 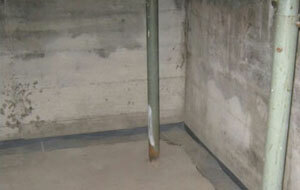 A waterproofing system keeps water from entering your basement. A waterproofing system can only be effective if it includes both drainage and sealers. There are three components of complete basement waterproofing systems: interior sealants, interior water drainage, and exterior waterproofing. Mold and mildew are caused by dampness and water. Our number one priority at Basement Technologies of the Alleghenies is to eliminate the source of mold production, water and humidity. After we correct these problems mold remediation will be in order. Click here to download our free engineer white paper containing information about how to solve a wet basement. Dirt or crawl space floors inside the home transmit humidity, odors and radon gas. They may provide rodents and insects an easy path into the upper living portions of the home. The humidity and dampness that is inherent in a crawlspace may also cause structural damage to the wood framing, carpets, floors and walls. This environment is a breeding ground for mold and mildew, all of which present a real problem. The best method is to use proper crawl space encapsulation techniques using a crawl space vapor barrier and a crawl space dehumidifier. A sub floor basement waterproofing system linked to a sump pump is considered by industry experts to be the most reliable and cost effective solution to basement water problems – but the consequences of a power outage or a mechanical failure at the pump could be catastrophic. With expert design and the best pump and backup products in the marketplace, we’ll make sure that you’re ready for any situation. The Basement Technologies PONI® II™ and Stallion Eliminator battery operated backup sump pumps are designed to back up primary residential sump pumps in case of pump or power failure. Homes have been described as having six (6) sides: four (4) walls; a roof; and one (1) basement floor. It is natural for the basement to be damp, sometimes we must create a new environment to thoroughly dry it. Some of the biggest complaints homeowners have are damp floors and basement humidity. Even though moisture is stopped by our Water Trek Aqua Route®, Floor Grate, and Water Grabber® Bulldog systems, dampness can still occur due to the temperature difference between the sub floor and basic humidity levels of the air. In order to control humidity, we have developed a line of patented basement dehumidifiers and crawl space dehumidifier systems to keep your home dry and mold-free. A wet or damp basement is a breeding ground for mold. Mold develops within the first 24-48 hours of contact with water. Mold can reproduce rapidly unless steps are taken to dry your basement. If left to multiply, you will find mold growing on your walls and ceilings and will begin to notice a musty odor. Mold takes many forms – usually a black stain (which is black mold) on sheetrock walls (which can be very dangerous to your health). The most important thing in a wet or damp basement is to eliminate the source of the water by installing a basement waterproofing system.